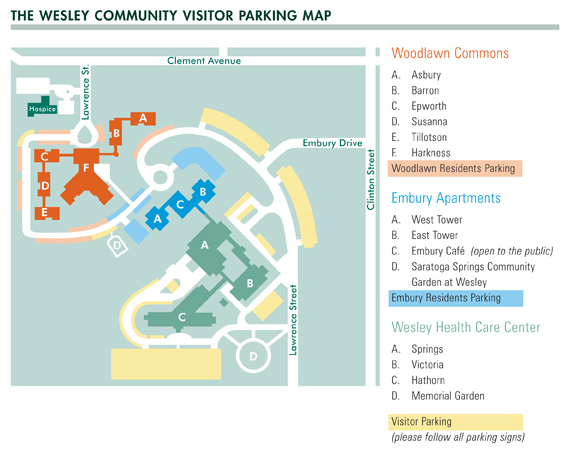 The Wesley Community is located in the heart of the beautiful and historic town of Saratoga Springs, NY. Located between the Capital Region of Albany and the Adirondack Mountains, Saratoga Springs is a convenient and central location that is easily accessible via exit 15 of New York’s Interstate 87. A reasonable distance to all Upstate, NY cities, Saratoga Springs is 45 minutes from Albany, two hours from Syracuse, and only three and a half hours from New York City. Once a Victorian health and gambling resort for the rich, Saratoga Springs is now a thriving and artistic community welcoming to all. Home to the famous Saratoga Race Course, Saratoga Performing Arts Center, and numerous museums, local restaurants, and boutiques, Saratoga Springs is a year-round destination. Take I-87 north to Exit 15. At exit ramp traffic light turn left onto Route 50. Continue on Route 50 until Broadway. Stay in the right lane and continue straight. (Becomes VanDam Street.) After the first traffic light, take the next right onto Lawrence Street. See the signs ahead indicating individual locations in The Wesley Community. Take I-87 South to Exit 15. At the exit ramp, bear right and yield onto Route 50. Continue on Route 50 until Broadway. Stay in the right lane and continue straight. (Becomes VanDam Street.) After the first traffic light, take the next right onto Lawrence Street. See the signs ahead indicating individual locations in The Wesley Community. Go north on Broadway until you see the City Center on the right followed by the Saratoga Hilton. Keep left. At the light, turn left onto Van Dam Street. After the first traffic light, take the next right onto Lawrence Street. See the signs ahead indicating individual locations in The Wesley Community. Take Route 29 to West Avenue in Saratoga Springs. (A Stewart’s Shops is on the corner.) Turn left onto West Avenue. Turn right onto Church Street and proceed past Saratoga Hospital. At the first traffic light after the hospital, bear left onto Van Dam Street. Take a left onto Lawrence Street. See the signs ahead indicating individual locations in The Wesley Community. Take Route 29 to Broadway in Saratoga Springs. (Adirondack Trust Company is on the corner.) Turn right onto Broadway. Go north on Broadway until you see the City Center on the right followed by the Saratoga Hilton. Keep left. At the light turn left onto Van Dam Street. Take a right onto Lawrence Street. See the signs ahead indicating individual locations in The Wesley Community.